Hit hard by extreme weather at the end of winter 2017/18, those responsible for Scotland’s trunk road network have worked to test out new techniques during a winter that has proved a lot less dramatic – but isn’t over yet. The 2018 ‘Beast from the East’ saw the Met Office issue its first red weather warning for snow in the devolved nation since the introduction of the colour-coded warning system. As traffic on the M80 came to a standstill, ministers including first minister Nicola Sturgeon criticised HGV firms for what they saw as ill-advised journeys in the conditions. Launching its 2018/19 winter service last Autumn, Transport Scotland said it was providing improved support and information and some new kit to keep drivers on its network moving. It added that it ‘continued to liaise with the haulage industry to ensure their members are aware of conditions and advice’. New vehicles added to the winter fleet included a customised Unimog, capable of spreading enhanced liquid de-icer; an electric powered spreader, to be deployed as patrol vehicle on the M8; and a Hilltip Icestriker from Finland, fitted with a V plow, to be trialled on the M80 to ensure recovery teams can access incidents in the most challenging conditions. Transport Scotland said specialist snow plans developed for specific parts of the trunk road network were actioned successfully this season on the M77, M74 and M80 before Christmas during the amber weather warnings for snow and ice. This included strategic pre-positioning of spreaders, the extension of winter patrols across contracts and the mobilisation of tractors with ploughs and recovery vehicles. A spokesman said: ‘While this winter hasn’t seen many challenging periods of adverse weather, let alone an event on a similar scale to the “Beast from the East”, Transport Scotland and our operating companies have still worked around the clock to monitor the trunk road network and ensure Scotland is kept moving. Bear Scotland manages 2,016km of trunk roads in the North East and North West. A spokesperson told Highways: ‘While we’ve not had as many major snow events when compared to last season, we’ve still been working round the clock to deal with prolonged cold spells in January and February, with road surface temperatures frequently dropping well below zero. Bear said its winter maintenance service largely involved precautionary treatments, spreading pre-wetted salt (30% brine with 70% salt) on routes forecast to experience low temperatures. 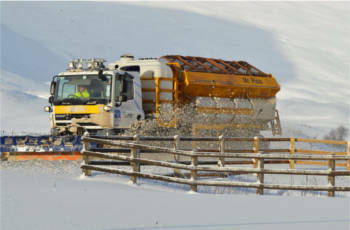 However, it told Highways it had trialled a brine combination spreader for the second time this winter on one of its routes in the North West, the A835 near Ullapool. A spokesperson said: ‘The brine spreader is equipped with a new method of dispensing the brine as well as automated technology, which maps the road and changes the width and symmetry of the spray automatically as the spreader proceeds along the route. Transport Scotland described the trial as ‘successful’ and said it would now look at how this type of treatment could be utilised elsewhere on its network. The Met Office revised its weather warnings last year and is now able to issue weather warnings up to seven days in advance. However, Ross Melville, senior advisor (Civil Contingencies) told Highways that despite media speculation on the potential for another “Beast from the East”, it never materialised and there were no conditions that required a seven-day warning. Police Scotland also revised its travel advice after acknowledging that motorists found the numbering system it was using to indicate the severity of travel warnings confusing. It said it would also issue specific guidance to drivers of goods vehicles, buses and drivers of other vehicles that may be vulnerable to being blown over on exposed routes. Transport Scotland said that thanks to the wind barriers on the new Queensferry Crossing, which is used by over 70,000 vehicles every day, there were many occasions over the winter when it has remained open where the Forth Road Bridge would have been closed entirely or closed to HGVs.